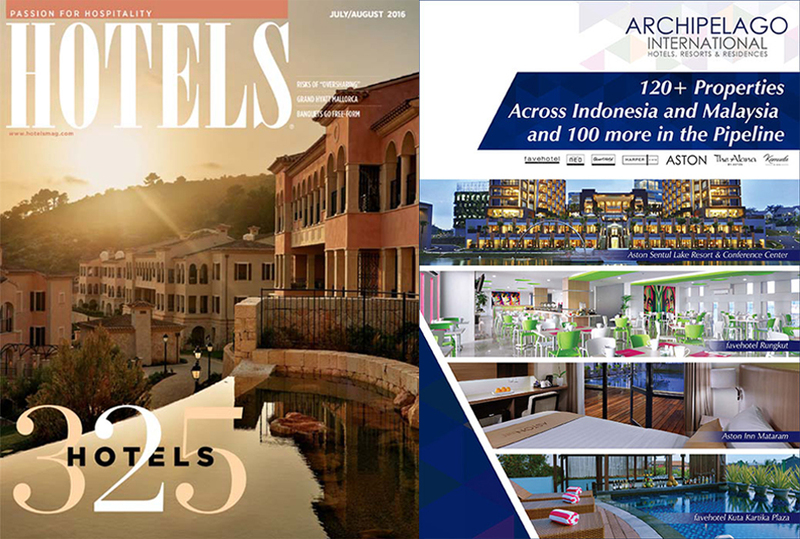 Jakarta, September 1st 2016 – Archipelago International, Indonesia's fastest growing hotel management company, has proudly been recognized among the top 100 largest hotel chains in the world by the prestigious Hotel Magazine. Based on its number of hotels and associating rooms, Archipelago International ranked 83rd in the world with more than 120 hotels and over 15.848 rooms by the end of 2015, thus placing the company as the number 1 hotel management chain in Indonesia. To reach such an achievement and ever since its inception in 1997, Archipelago International has continued to adapt to the dynamic growth of accommodation demands in Indonesia. In the last four to five years, the high demand for accommodation has been bolstered primarily by Indonesia’s position as one of Asia’s most popular tourist destinations. This growth has risen through catering to the middle-segment of the market, namely with 2, 3 and 4 star hotels. Further adapting to the thriving market development, Archipelago International is continuously expanding in Indonesia with the opening of more than 20 hotels and resorts by the end of 2016. Already in 2016, Archipelago International has opened 11 hotels totaling 1.583 rooms in 10 different tourist destinations, namely favehotel Ahmad Yani - Banjarmasin, favehotel Pekanbaru, Aston Sentul Resort & Conference Center, favehotel Banjarbaru - Banjarmasin, favehotel Rungkut - Surabaya, favehotel Cilacap, favehotel Ahmad Yani - Bekasi, favehotel Subang, favehotel Kuta Kartika Plaza, Harper Pasteur - Bandung, and Aston Inn Mataram, aiming to reach both the local and international markets. For future development, Archipelago International also plans to open a further 50 hotels with 7000 rooms by the end of 2020. “We are proud to be recognized as one of the top hotel management companies worldwide. Our goal is to double our portfolio to more than 220 properties over the next few years. We have seen a lot of interest in our brands internationally, encouraging us to expand our 7 brands: favehotel, Quest, NEO, Harper, Aston, Alana, and Kamuela, to be the future leader within the hospitality industry, especially in Indonesia and Asia,” said Norbert Vas, Vice President of Business Development & Operations Archipelago International.